I don’t know if any of you caught the miniseries Lost in Austen that was on TV a few years ago. I watched it, loved it, bought the DVD for my mum (a fellow Austen devotee)..and then watched it all over again with her. We adore Jane Austen…books, movies, mini-series…we’re not picky. If it’s Austen my mum and I are glued to the screen shushing anyone who might happen to hove into view (or earshot.) When my husband and I are down east visiting each summer… he does a lot of fishing to avoid being in the house and having to endure the yearly Austen hysteria. In Lost in Austen the scene which resonates with me is when the main character, Amanda Price, pushes open the mysterious door in her modern day bathroom and crawls into another world, the world of Regency England and of Jane Austen’s Pride and Prejudice. I have been watching and loving Downton Abbey (me and a few million other people.) from Season One, Episode One. Every year, for the last five. And each episode I feel like I would love to be able to open a door, like Amanda Price, and step into that world for real. But while I do like the characters and the plot, it’s the setting and the costumes (particularly the costumes) that create such longing. I would love to go back in time and own all those wonderful clothes and hats. Maybe that’s why I love vintage clothing; it fulfills my innate desire to recreate the past. And while I have admired the costumes of Downton from season one, episode one, scene one ….they have just kept getting better and better. The dresses and coats are divine. 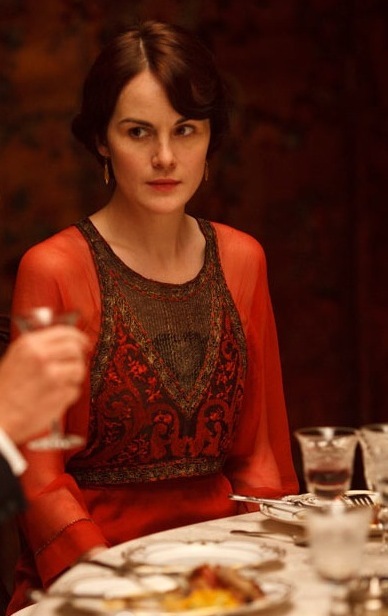 I would love to own this dress and knit vest worn by Lady Mary. Photo found on The Knitting Needle and the Damage Done Blog. Check it out for cool patterns based on vintage designs. 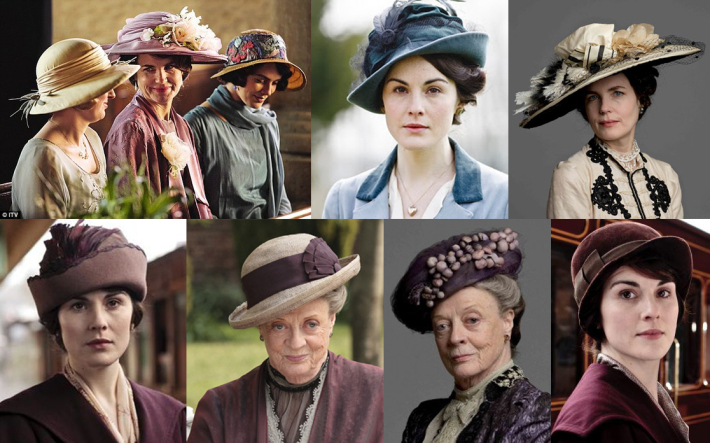 But though the dresses are divine … it’s the hats that I really covet. In fact when I first saw the hat above, I even felt a tiny bit of déjà vu. A little frisson of recognition. Had I perhaps worn it in an earlier life? ….well, perhaps. But my recognition was a bit closer to home than that… Holy cow! I thought … I owned that hat! Or one very like it. I have been collecting vintage hats for 20 years or more. I love them. I have rarely worn them, but for years, I used to display them in my spare bedroom. Eventually, lack of space and a desire to de-clutter made me put them away. Then I carted them off to school one day. I used to do a fun activity with my Creative Writing class called “prop writing.” It’s an idea that I got from a Natalie Goldberg book called Writing Down the Bones. She suggests that using a prop can help writers put themselves into another place or character. So in my class we had “prop writing” where we would bring hats or other items that might suggest a certain character type. The students had to wear or hold the prop and then write from the point of view of the person who might own that prop. They would write for 10 minutes and then try another prop. Then we would read them out loud. Sometimes it was hysterical, sometimes moving, sometimes kids really surprised themselves that they could so completely write in a voice so totally different from their own. And my vintage hats became very useful props for this activity. When I retired I brought them home again and stuck them in a cupboard. Until one day a few months ago when I dragged them out again and had a grand old time playing dress up. This is my 1920’s cloche. It has tiny jet beads on it that don’t show up in the picture. You can’t see the bow very well either. I love it …but it’s just not me, really. This is my all time favourite hat! As you can see, I really was playing dress up. I changed my jacket and scarf for this hat. I am not sure if it is from the 30’s or 40’s. I bought it at an antique sale in the 1990’s. My friend and I had stopped at a booth and were trying on all the hats they had. By the time we actually purchased something, we had a crowd of elderly ladies oohing and ahhing around us. “Oh, you REALLY must buy this one, dear!” And so I did. This is my very first vintage hat purchase, way back in the late 80’s. It has real leopard skin on it and it’s hand made. It’s just a brown felt tube with a stuffed strip of leopard hand sewn on to it. Not sure of the vintage since there is no label. This is the only one that I have worn more then once. I’m sure it’s from the 1940’s. I bought it for 10 bucks in 1989. There’s a tatty brown ribbon tied in a bow at the back that can’t be tightened anymore … I’m afraid it will rip. I love it, especially the Bakelite brooch that came with it. 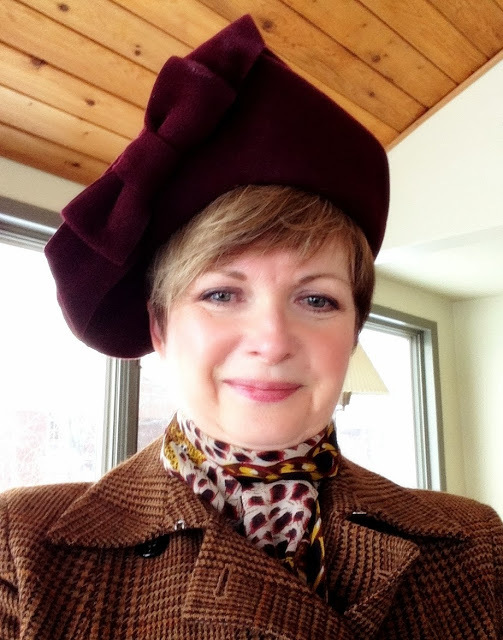 The brooch was in the hat when the vendor bought it….so she sold it with the hat. You sure couldn’t buy a Bakelite brooch for 10 bucks now! These days, at least for the last few years, our visits down east have a slightly different ritual. My husband still fishes a lot. But instead of our Jane Austen marathon, my mum and I watch as many episodes of Downton Abbey as we can squeeze in. She has all the DVDs, of course. This year we’ll be watching the final season of Downton together. It’s sad that the show has to end. But it’s been an amazing ride. I’m excited to see what season six will bring. Maybe this year, when I visit Mum, I’ll bring along a few props for us to wear…. when we get lost in Downton. 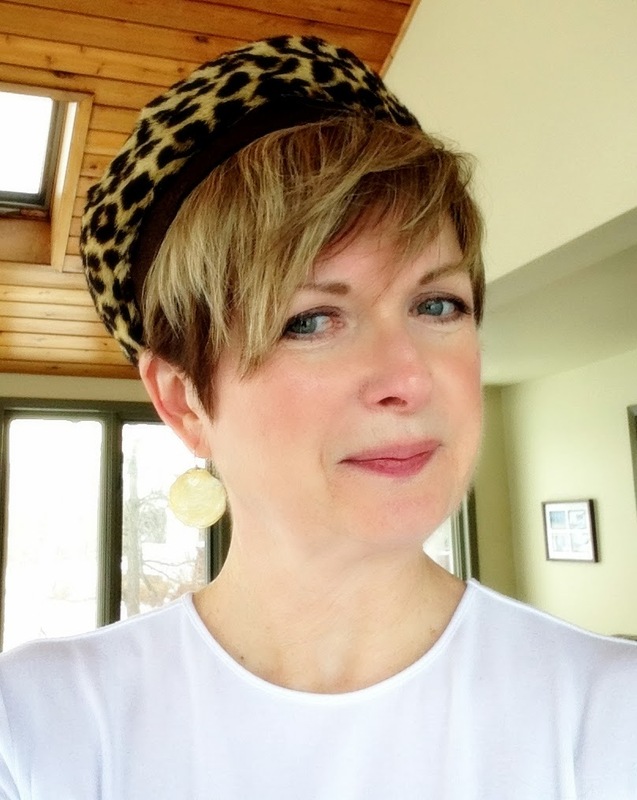 Of Art and Healing … and Friendship. No props, no hats, no Austen tales. . . all I can offer is that I loved reading Doris Athill's Instead of a Letter. Athill, a renowned literary editor now in her late 80s or early 90s, writes in this memoir about her early years on a family estate in England that has many parallels with Downtown Abbey — I suspect you'd enjoy at least that part of the memoir. And have you read Kate Atkinson's Life after Life? It's set in a similar period, one of my favourite books of 2013. Thanks for the suggestions…they are now on my list. I've read Atkinson's other books, but not this one. The other sounds right up my street! Have you watched, "Call the Midwife"? It is a wonderful period drama based in London during the 1950s. I fell in love with as quickly as Downton. You can find season one on Netflix. I'll have to give that a try. Hmmm..fifties dresses…and those tiny hats! Oh, that red velvet hat is a show-stopper! I love how you've styled it too. 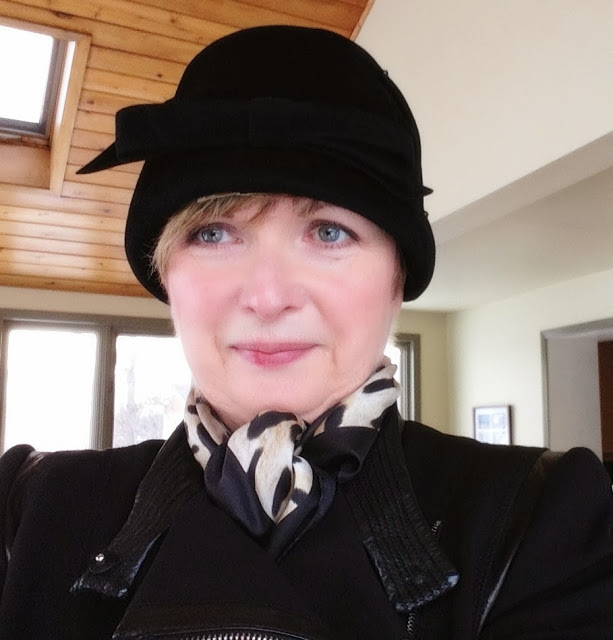 I have such a small head that very few hats will fit, but back in the early 80's I did find a 1920's-30's era grey cloche in a vintage shop and wore until it was in tatters. Thanks, Sue. 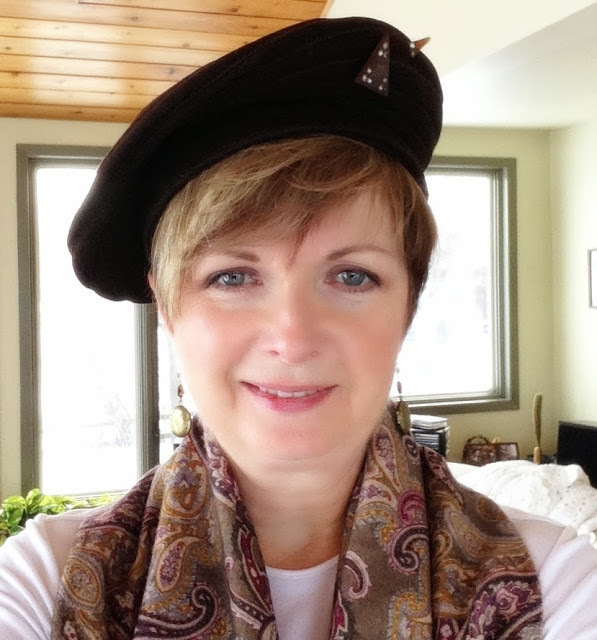 I feel silly in my cloche…and I think it's because I have such a big head.